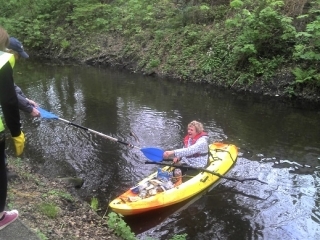 Gill was one of the first to hire a kayak today and paddled off. Being Gill she couldn’t just relax, but collected a mound of litter on her way, supported by Esther and a litter picker on the tow path. She also removed several bits of tree from the canal, and was assisted into the bank as her hands were full by Martin and Esther. Esther and Gill managed to gather a wheel barrow full of litter. Meanwhile the others carried on with the hiring or canoes and Alvena made sure everything was kept in order. More photos to follow when Dean gets a chance to send them.